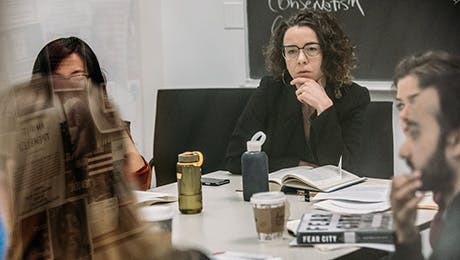 The Graduate Certificate in Gender and Sexuality Studies is a 12-credit curriculum that draws on courses offered across The New School. External applicants not already enrolled in a New School graduate program must first apply here and be admitted before starting the certificate process outlined below. The certificate is open to all current graduate students at The New School, as well as students who apply directly to it. For students already enrolled in a New School graduate degree program: Complete an enrollment form and make an appointment with one of the GSS co-directors to discuss your planned course of study. Each year, before fall and spring registration take place, we will post a list of gender and sexuality studies electives that count toward the certificate. An archive of past courses is also available. See eligible courses for the fall 2018 term. See eligible courses for the spring 2018 term. Up to two electives may come from your home department or program. At least one elective must come from another department or college at The New School. No more than 9 credits can count toward both your degree and the certificate. Electives must come from at least two different departments at The New School. During or after the semester in which you complete your certificate course requirements, you should make an appointment to meet with one of the GSS co-directors. You must bring with you a completed exit form and an unofficial transcript to demonstrate your successful completion of the course sequence. Following the successful completion of all these requirements, the co-director will confirm your qualifications in scholarship in gender and sexuality studies. Your graduate certificate will appear on your final transcript and your degree from The New School. Visit our blog to learn more about the program, related events, and the students enrolled.